One of the big advantages of the internet is that anyone can participate. We are no longer limited to big publishers or exclusive media channels. That means as a scientist I can communicate directly with people interested in science all over the world, and I’m not beholden to advertisers or managing editors. Of course this freedom of communication comes at a price. Just as I can communicate directly with the world, so can everyone else. As a result, there’s a lot of crazy things that spread across the information superhighway. Many of them are in the form of memes posted on social media sites. Given that many of these are even posted on sites that claim to promote real science, I thought I’d dispel some of the misconceptions surrounding some of these memes. So here are 10 popular memes, ranked from least grievous to most. This ever popular one derives from the fact that the bad astronomers decided to strike Pluto off the planet list. Never mind the fact that we did the same thing to Ceres, and the fact that Pluto has the characteristics of a Kuiper belt object rather than a planet, or that it isn’t even the largest body in the outer solar system. Despite all the uproar, Pluto is still categorized as a dwarf planet, along with four others. So in a way there are now 13 planets, rather than 8. But the only real gripe with memes like this one is that it promotes the idea that we shouldn’t revise scientific ideas when we’re emotionally attached to them. 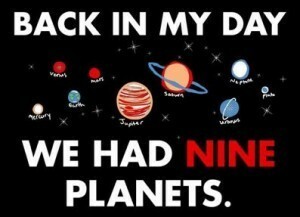 Pluto should still be a planet because we love it so much. Who cares about the facts. Of course that’s not how science works. This one is a variation of the idea that the universe is huge, and we are tiny. While that’s true, it isn’t quite as severe as the image suggests. 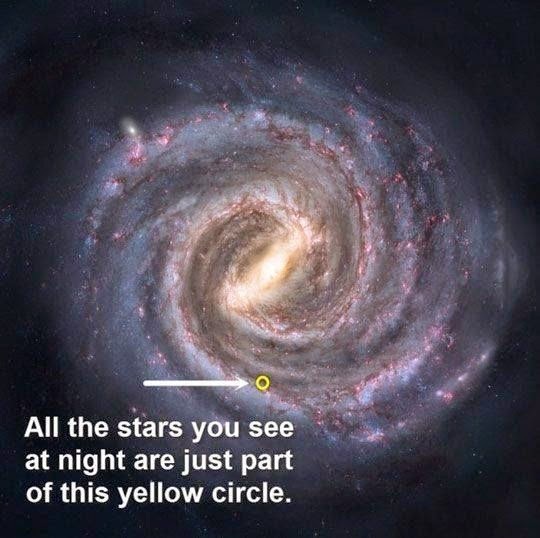 Given that the Milky Way is about 100,000 light years across, the circle shown is about 2,000 light years across, or a thousand light years in radius. While it’s true that most stars visible with the naked eye are within a thousand light years, it isn’t the case that all of them are. Deneb, for example, is the brightest star in the constellation Cygnus, and is about 2,500 light years away. There are even more distant stars that are dim but within the naked eye range. 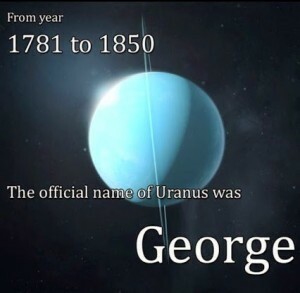 Uranus was the first planet to be discovered in recorded history, which meant it was given a name rather than simply being known since the dawn of history. 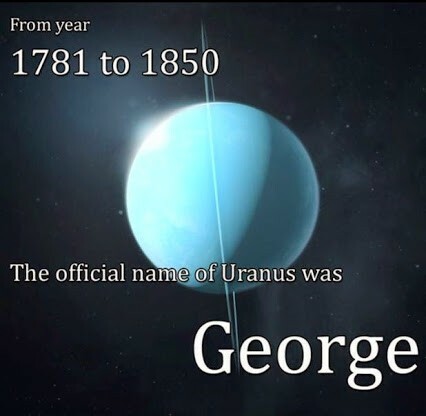 But it was never named George. William Herschel, credited with discovering the planet, wanted to name the planet Georgium Sidus (George’s Star) after George III. But this name was never popular, being so anglo-centric. Some suggested naming it Herschel, but Johann Bode suggested Uranus, father of Chronos (Saturn) and grandfather of Zeus (Jupiter). That’s the name that eventually won the day pretty quickly. Her Majesty’s Nautical Almanac Office continued to use Georgium Sidus until 1850, but by then the rest of the astronomical world had long since moved on. This one follows the ever popular idea that atoms are mostly empty space. The premise here is that a proton is roughly a femtometer (trillionth of a millimeter) in size, and an electron has a classical radius about twice as large. But the problem with these types of memes is that they promote the idea that atoms are nuclei with electrons swirling around them, like miniature solar systems. As we know from quantum theory, that’s not how it works. 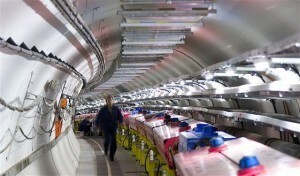 In fact the “size” of an elementary particle doesn’t really have meaning in the classical sense. Interestingly, a white dwarf is a star gravitationally squeezed to the point that the electrons of atoms can’t compress any further due to degeneracy pressure. Given the mass of humanity (roughly a trillion kg) and the density of a white dwarf (about a billion kg/m3), that would put the volume of humanity at about 1,000 cubic meters. 5. As Einstein once said..
Give that meme an Einstein quote, people love Einstein quotes. Some of the popular quotes by Einstein were actually said by Herr Professor, but most of them weren’t, or are largely taken out of science. If the internet is to be believed, the guy had opinions on everything from childhood education to new age philosophy. It’s a classic argument from authority. 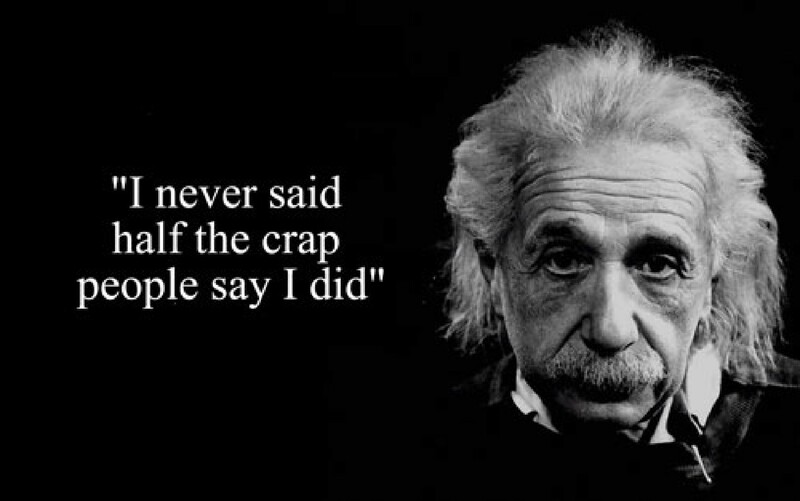 If someone as brilliant as Einstein said it, it must be true. Of course in science, even the most brilliant can be wrong, and Einstein was no exception. Perhaps the most awesome big idea from astronomy is the fact that we are made of star stuff. This meme is striving for that idea, but for some reason it separates water from everything else. Given that water is hydrogen and oxygen, and oxygen was produced in stars, water is also made of stardust. Despite that error, there are some cool facts about the water in our bodies, for example much of it is likely older than the solar system. This one is classic. The ancient civilizations began climbing out of the swamp of ignorance, but then the dark ages came and ruined everything. Things only got better when Europe entered the age of enlightenment. Never mind the fact that the Arabic empire was advancing astronomy at the time, or Indian mathematics, or China. Europe was in a dark age, which is apparently all that matters. Besides its Eurocentric take on history, this one also promotes the misconception that progress is ever onward and ever upward. It’s similar to the misconception that organisms evolve toward a goal, which simply isn’t the case. Whenever Mars approaches opposition it tends to be a bit brighter than usual. It is also visible for most of the night, so it’s worth seeking out. Around the same time the images claiming Mars will be as big as the Moon show up again. 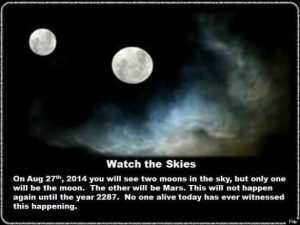 There are similar ones that make the rounds, such as the idea that this month’s supermoon will be several times larger than normal, but the Mars meme comes around so regularly that when you see it you know Mars is approaching opposition. The video that simply won’t die. 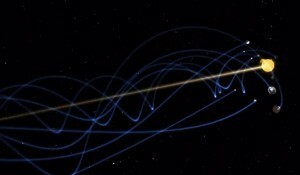 It’s slick, it’s cool, and it shows the solar system moving through space! Unfortunately it has so many things wrong with it. It shows the Sun moving along its axis of rotation, which isn’t how it moves through the Milky Way, it has the planets in the wrong order, etc. If that’s not bad enough, it goes on to claim that the solar system is a vortex, and that this connects to the DNA helix of living things, and other pseudoscientific concepts. But because it is so visually appealing it makes the social media rounds again and again…and again. While many memes have at least some grain of truth to them, some are downright nonsensical. Take, for example, the supposed quote from Neil Tyson. Sure, Tyson is cool and all, but this one takes the cake. Thanks for this, I enjoyed learning it. Yogi Berra said, “I didn’t say all those things I said.” You suppose he thought he was quoting Einstein? In these days of pseudogovernment, pseudonews, pseudoconcerns, all about which it seems there can be no meaningful discussion, it does one good to know that at least in the discipline of science, refutations can have meaning and we can then simply go about our business of learning.